Two people will create together an image of touch using webcams. Under physical constraints of the used technology, which recalls those suffered by our body during daily computer use, they will touch each other in a vacuum. The public can see both, the created image in a video projection of two webcams and the two bodies positioned in space resembling living sculptures and minimal dance. Related to Touched and Manipulated. Merci à La Tapisserie. In 2009 I started the artistic research project Huis Clos / No Exit. In this project I use a specially developed interface to unite several people remotely in a shared performance space that becomes subsequently both a laboratory and a playground. The performance experiences using this interface, suggest that today’s intimacy is no longer revealed through private images but through behaviour captured in real time interactions. In her book “Alone Together” Sherry Turkle  describes how we hide more and more behind technology, how intimate communications start being something to avoid rather than to look for, how smartphones help us to flee our fear for the other, how we learn to control our relations via interfaces and how we are adapting our behaviour to this new situation. Facebook teaches us how to simulate intimacy, how to make relations easy, clean, and without danger. At the same time these relations also become superficial and makes us ask: Who are we when we don’t perform? Why can’t we show our vulnerable, messy sides? Why can’t I be boring and cherish solitude anymore? In a society where authenticy and privacy become endangered it is important to find ways to access our vulnerabilities and doubts, to make them public, to cherish our messy side, to make place for the beast in the beauty, to go back to reality, to claim the human. In 1998 I worked with at least 8 other French artists, I never met, on a collaborative website called lieudit.org . The site and the collective died in 2000 but I still have very nice memories of for instance our IRC rendez-vous during the launches of the virtual exhibitions we organised. Collaborating in a shared website was very stimulating, but in the end we couldn’t find a common goal to make us negotiate better our differences and so we split up. It was very frustrating to learn that behind our machines we couldn’t overcome these political and philosophical and emotional differences, that problems were exaggerated and stayed insurmountable. This was the first time I noticed that collaboration using machine wasn’t easier, maybe not more difficult either, but different from ordinary face to face communication. Later experiences with online collaborative creation interfaces as for instance Furtherfield’s VisistorsStudio confirmed this. In telematic performances intimacy is not there where you think it is. The Big Kiss performed with Mark River (of MTAA) in New York in 2008  might have looked as an intimate performance, but in fact it was closer to a “drawing à deux” session than to a real kiss. (even if it did awake intimate feelings as drawing on paper of a kiss might have done too). In the telematic performance “One the puppet of the other” with Nicolas Frespech (Paris 2007) , we felt most intimate, most close together when we didn’t exchange, when we were waiting, when nothing happened. In 2008 I started Huis Clos / No Exit : A networked performance series investigating collaboration at a distance – the project was also about relational dynamics in a dispersed group. With an interface developed by Clément Charmet (panoplie.org) and Estelle Senay (x-réseaux – Théâtre Paris Villette) I could unite the images and sounds of the webcams of up to 6 participating performers in a mosaic. The physically separated performers could share borders and interaction surfaces in a common virtual space and become co-responsible for the mosaic image projected in front of the public during performances. At all times they had this same mosaic image on their screen. A first experiment took place in November 2008 in the International Laboratory Interactive digital media on stage organized by NU2’s in L’Animal a l’Esquena, in Celrà, Spain. In one of the tests I asked three performers to execute a protocol that stated that, before leaving the performance interface they were to compliment the others after having insulted them. It was strange and beautiful to see how they couldn’t stop complimenting and saying nice things to another. Later I became more and more aware of how the performance interface, besides allowing observation of behaviour in collaboration and auto-organisation, can also reveal private, intimate behaviour to the public. 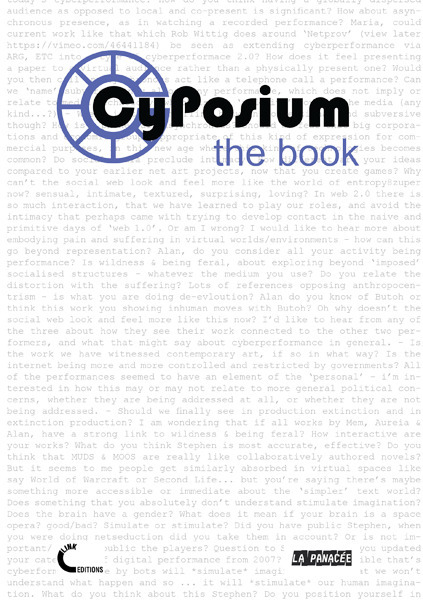 The cyberperformers are so occupied by their interactions, that they don’t have time to negotiate their image as they mostly do on the Internet. Sherry Turkle, “Alone Together: Why We Expect More from Technology and Less from Each Other” (New York: Basic Books, 2011). Annie Abrahams, “The Big Kiss”, 2008, http://www.bram.org/toucher/TBK.html (accessed September 7, 2011). Annie Abrahams, Nicolas Frespech, “One the puppet of the Other”, 2007, http://www.bram.org/confront/sphere/indexeng.html (accessed September 7, 2011). Annie Abrahams, “Huis Clos / No Exit”, 2009, http://bram.org/huisclos/indexang.html (accessed September 7, 2011). Maria Chatzichristodoulou, “Annie Abrahams, Allergic to utopias”, Digimag 58 October 2010, http://www.digicult.it/digimag/issue-058/annie-abrahams-allergic-to-utopias/ (accessed August 30, 2016). Panel : Intimate TV: Webcamming & Social Life-logging In the Surveillant-Sousveillant Space. Lunch Bites is a series of hour-long lunchtime conversations, hosted in Space 7, Culture Lab at Newcastle University, featuring local and visiting thinkers and creators. Maria Chatzichristodoulou (aka Maria X) will be presenting “Allergic to Utopias: The work of Annie Abrahams“, followed by Christopher Newell’s “Silence, sounds and slips – enhanced communication through miscommunication”. # Katharine E. Low: Risk Taking in Sexual Health Communication and Applied Theatre Practice: What Can Happen?